Did you know that New Kids On The Block have a hyperbaric oxygen chamber on tour with them?! EXCLUSIVE: New Kids On The Block's Jonathan Knight explains how he got his broken nose! Here are some articles, photos, videos and reviews NKOTB's The Main Event tour. Danny's new single "Look at me" is now available on iTunes. Click here to get it! You can watch a re-run of the Yahoo Live Stream show from the concert in Dallas last week until tonight below. 1. They introduced a new, New Kid on the Block? Joey, the youngest member of the group, made it clear that the boy band from Boston won't be retiring anytime soon. He brought his 7-year-old son, Griffin Thomas, on stage to provide some lead vocals for the song "Tonight." The handsome kid has show business in his blood. He boldly took center stage and waited for his cue to belt the opening lyric, but not without first hyping up the crowd. We're surprised the group didn't have Grif stand-in for Jonathan earlier in the week when a fall caused him to miss a Los Angeles show date. 2. Joey made some sweet dreams come true. All of the guys have stayed fit, an enviable feat for five men in their 40s. The group was so confident about their physiques that they actually allowed cameras in their dressing room tents to broadcast for the audience a quick costume change that revealed plenty footage of abs and underwear. But Joey definitely pushed the limits when performing a cover of the Eurythmic's 1983 classic "Sweet Dreams." In his interpretive performance, he channeled Annie Lennox as he danced across the stage and sang from his heart. He stripped off his jacket to take the stage shirtless and barefoot and the 42-year-old husband and father looked better than most of the new singers half his age. 3. Danny partied like it was his birthday. Without missing a beat, NKOTB sang live and danced throughout the high-energy show. However, birthday boy Danny wanted to extend a bonus gesture to the screaming fans. His father, "Big Danny Wood," joined him on stage for the "Happy Birthday" song and cake and during his solo set the 46-year-old star put his street dancing skills to work, dropping to the ground to bust a backspin move that would be impressive for anyone of any age. 4. The legacy of Marky Mark and the Funky Bunch lives on. The tradition of big brothers teasing little brothers shall never cease. Even though Hollywood, blockbuster actor Mark "Marky Mark" Wahlberg wasn't in the house, it didn't stop his older brother Donnie from having some fun with his signature hit "Good Vibrations" from his short-lived rap career. During one of the night's many cover song segments, when the pianist played the throwback track, Donnie quipped, "Just 'cause I wrote it don't mean I got to sing it." Then, they brought a couple ladies on stage to help them party to the song. 5. They rocked without the roll. Though NKOTB's rock-influenced track "Cover Girl" did well on the charts back in 1989, the group was known for their pop stylings for a reason. During Donnie's solo segment he assumed his lead vocals but wisely relied heavily on the band's guitarists to drive the performance. Yahoo interviewed NKOTB about their 25th anniversary, One Direction and Zayn's departure from the group, their Cottonelle sponsorship, the differences between being in a boyband now vs when they first started out, knowing Jennifer Lopez and Lady Gaga before they were famous, Joe's son Griffin coming on stage, fashion regrets, celebrating their birthdays on stage and more. Much to the delight of their fans, groundbreaking boy band New Kids on the Block is back on tour this summer, this time with Nelly and TLC. Here’s what NKOTB’s Joey McIntyre had to say about the band’s past and what to expect from this tour. New Kids on the Block, the poppy boy band that enjoyed a decade of success from 1984 until 1994, reunited in 2007 and released an album featuring new music in 2008. NKOTB hasn’t slowed down since then, going on tour with other boy band acts like the Backstreet Boys, 98 Degrees, and Boys II Men. This summer’s tour pairs the grown-up but still sizzling pop icons with fellow throwback favorites TLC and Nelly. 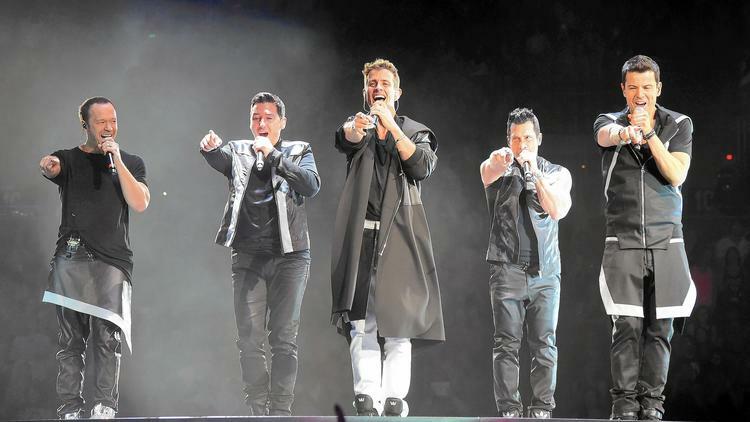 We caught up with NKOTB’s Joey McIntyre in advance of the tour’s stop at The Forum this Saturday (May 9) to find out his favorite NKOTB song, if the group has any rivalries with other boy bands, and, of course, his thoughts on fanny packs. How did New Kids on the Block first form? JOEY MCINTYRE: It wasn’t a casting call—it wasn’t like a big cattle call with thousands of people. It started with Maurice Starr, a writer and producer, who wanted to form a group that was like New Edition but with white kids, and the first guy he met was Donnie Wahlberg. For a while it didn’t really go anywhere, but then Donnie took it upon himself to go find [other] group members. He found kids he went to school with, kids he knew could sing, kids that were in the church choir—[he] literally just drove around the neighborhood. [The group] was together for a few months and they knew they wanted a little guy. Even though they were 15 at the time, they wanted a 12- or 13-year-old. I was a couple of towns over in Boston doing musical theater. They were calling schools and my name came up and I auditioned. The next week I was in the studio with them, and the rest is history. What is the most outrageous, completely '80s/'90s outfit you ever wore in the early days of NKOTB? JM: The fanny pack. We used to rock fanny packs. And my hair got very big at one point in time. Between those two, I was representing well. What is your favorite NKOTB song? JM: “Cover Girl.” I mean, “Please Don’t Go Girl” is probably in a class by itself—that was our first top ten hit—but I just like “Cover Girl.” It’s just really sugary and very pop. You've performed with a ton of other '90s acts like Backstreet Boys, Boyz II Men, 98 Degrees, and now TLC and Nelly. Any favorite moments? Are there any rivalries? JM: We’ve had a great time on every one of our tours—teaming up with the Backstreet Boys was a great combination. I think that tour was a home run and considered a really great tour within the industry, and our fans were certainly happy. Boyz II Men are just a phenomenal group. To share the night with them was awesome. [There were] a lot of laughs—those guys are really funny. We had a blast backstage. We’re just starting with TLC and Nelly but they’re really good people—really warm and really happy to entertain and give people a great show, so it’s nice to be around that energy. What sets this tour apart from other tours? JM: I think it’s a little out of our box with TLC and certainly Nelly. We’ve usually have a boy band package; this is a little more musically-loved. TLC is arguably one of the biggest girl groups in the world and [has a] history of pop music, so that’s a good combination for us. Every time we go out on tour, we want to be excited, we want to get goosebumps. And if we get goosebumps, we feel like our fans and the crowd [will be] excited. We’ve got a huge stage in the round, it’s very interactive with the audience so it will be exciting. Any favorite places to hang out in LA? JM: I like Osteria La Buca on Melrose. Soho House is the prettiest place to hang, you can’t get better than that. I like to run—I’ll go all the way from Crenshaw up to Griffith Park. What I love about LA is it’s such a melting pot. You could be in Hancock Park with big houses and then half a mile away you’re running past bodegas and swap meets, which I love. That’s what makes LA such a well-rounded place to live. The New Kids on the Block were on Ryan Seacrest's show and they surprised a fan by bringing her into the studio to meet the guys. Here is a clip. Yahoo will be live steaming The New Kids on the Block concert at the American Airlines Center in Dallas, TX on May 14 at 10:00 p.m. ET. Click here for the link to watch! Ryan Seacrest announced on his radio show today that the New Kids on the Block will be making a guest appearance on American Idol next Wednesday night! 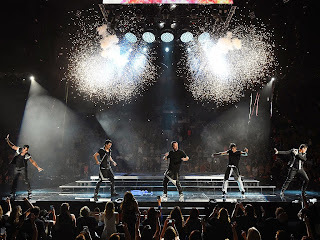 Friday, May 1, 2015 | 2 a.m.
NKOTB are Las Vegas regulars when they tour every other year, with stops in recent years in Sin City at Pearl at the Palms, Mandalay Bay Events Center and, last summer, Axis at Planet Hollywood. Mandalay Bay in Las Vegas on Friday night is your first stop of “The Main Event” tour. What are you looking forward to most? The challenge of making every seat in the house a good seat. It’s a massive stage, and we want to give everyone a good show. We’re working on it now, and we’ll be working on it right up until they open the doors. It’s a challenge, and I’m looking forward to it. Do you still get first-night or stage nerves? Maybe a little bit, but not much. We’ve been at this a very long time (laughs). We’re excited and anxious, but not nervous. You’re touring nonstop for at least the next two months. Do you enjoy touring after all these years? Of course, man. It’s so much better this time around now. We’re so blessed that we get to do this twice. After a 15-year break, it’s such a blessing. The hard put now is putting it all together, but it’s coming together. We want to make it a very special show. What’s your favorite song to perform? It changes from tour to tour. This time around, it’s probably “Block Party” off our album “10.” It’s a lot of fun, and it really gets the crowd right into the show. You are incredible shape. What’s your secret? Well, I’ve been working out for 25 years — that’s the biggest secret (laughs). It’s all about what you put in your body. You can work out all you want, but there’s only one right way to eat. I watch what I eat, and I drink a lot of water. I’ve seen NKOTB quite a few times in Las Vegas — at the Palms, Planet Hollywood and Mandalay Bay. Would you sign on for a residency here? I would love it! I love all three venues. When we’re in Las Vegas, the people treat us so nice. And to go from your room to the elevator to do the show, it doesn’t get much better than that. I would love it, but it’s a matter of when and different schedules of a group of guys doing different things. But I think that we would love to do it. What do you work on when you’re not touring? I’m a single dad, a single divorced dad, and that takes up a lot of time. I also do a lot of charity work for my mother’s foundation, The Betty Wood Cancer Foundation — Remembering Betty, for breast cancer awareness and patients and care. I’m happy and content being a New Kid, doing charity work and taking care of my kids. Who are some of the artists you’re listening to right now? I like a lot of old music and a wide variety. If we’re talking about current artists, I like Ed Sheeran and Christina Perri. Jason Mraz is another guy I like. But I like old music, The Stylistics, The Bee Gees, Hall & Oates, The Eagles. When I’m working out, I like hip hop and Linkin Park. If you ask anyone that question nowadays, nobody listens to one genre of music. People listen to different styles of music. What do you like to do for fun in Las Vegas when you’re not working? I don’t do anything! Last night, we finished rehearsals at 1 in the morning. It’s go and get some sleep time. The tour prep, that’s when the real work is done and my focus. I don’t gamble or party; I am focused on the show’s opening night, them moving on to Anaheim. What is one lesson you’ve learned in your long career in the music industry, and what would you tell someone entering the music industry today? A lesson I’ve learned? I don’t know, man. We were lucky the first time around. This second time, we have a great team of people. We’ve learned a lot of lessons in a 30-year career. We got lucky to get a second chance. After a 15-year break, we’re back playing arenas, sold-out venues. We’re lucky guys. We’re in our 40s now, and we play different roles. Some of us are more on the business side, some of use are on the creative side. We watch everyone. We’re sometimes older than our team of people, so nothing gets past us. It’s much different than being in your 20s. My advice to someone starting out: Surround yourself with a really good team of people. It’s hard when you’re young to know who’s good and who’s … look at artists you look up to and look at their team. You’re performing on the eve of the big Floyd Mayweather Jr.-Manny Pacquiao fight. Prediction? No, not really. I wish they would’ve done it a while ago. I’m not as interested now. I mean, I’m a big boxing fan — (Marvin) Hagler, (Tommy) Hearns, (Roberto) Duran, Sugar Ray Leonard. Mike Tyson was the man — (Evander) Holyfield, (Lennox) Lewis. It’s been a long time, and this fight is past due. They’re hyping it, but it should’ve been done a while ago. But it’s still the biggest fight since the last big Tyson fight. I’m happy that they’re finally doing it, but it should’ve happened five to eight years ago.